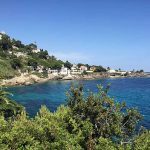 Oceanographic Institute and Plage Mala – A Perfect Day-Trip from Nice! 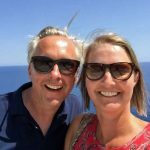 Nice is a fantastic destination where you have both the city, the picturesque old town and the beach but sometimes you want to do a daytrip out of town. 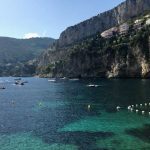 Then I can recommend doing Monaco as a day trip from Nice, including the Oceanographic Museum in Monaco and the beautiful beach, Plage Mala, in Cap D´Ail, France. 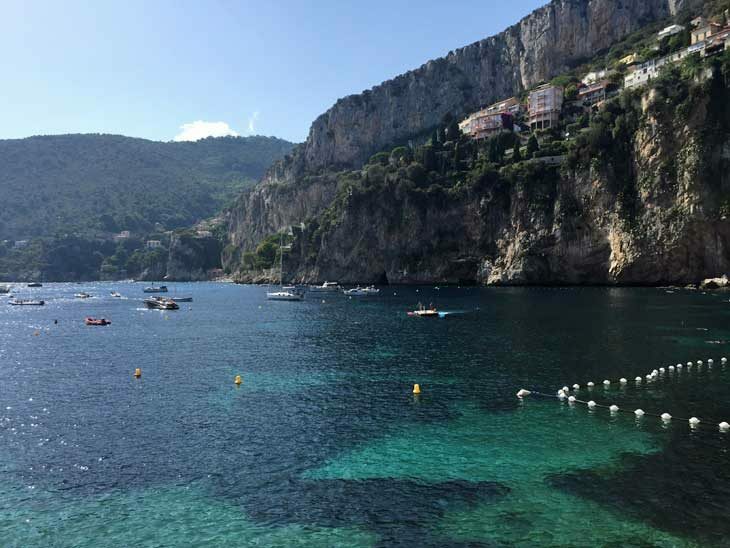 Start the day by taking a 20 – 23 min train ride from Nice Central Station to Monaco. I usually use Rome2Rio.com to check the timings. Some online services mentions Bus 100 from Gare de Routiére but as far as I understand, that bus station is closed. At the station it is very easy to purchase tickets in the self-service kiosks where you can pay by cash or credit card. July is peak season in Southern France and you can expect lots of people on the stations and full trains. It is not a problem for me, but if you are traveling with small children or someone with a disability, you might want to allow a little more time on the stations. Prince Albert I inaugurated the museum in 1910, the same year Jacques Cousteau was born. Cousteau was a conservationist, filmmaker innovator and scientist who became the institute´s Director between 1957 – 1988. The museum is filled with things Cousteau constructed and used during his expeditions. Are you one of those people who starts yawning when you hear the word museum or institute? Fear not, because the museum is packed with information and history but far from boring! Everything is presented in a light-hearted, playful manner and caters to all ages. 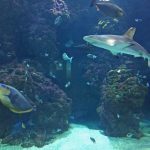 You will be able to pet sharks, see movies about oceanography, meet turtles up close and personal, walk around the exhibitions, have lunch on the roof top and see lots and lots of beautiful fish in the aquariums. Shark in one of the aquariums at Institute Oceanographique in Monaco. This is how happy we were to visit the Institute Oceanographique. The magnificient view from Institute Oceanographique in Monaco. 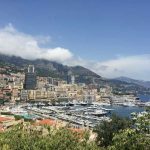 It is about a 20 – 30 min walk from the Gare Monaco to Institut Oceanographique and parts of the walk is hilly with easy steps, offering nice views over Monaco. You will be able to experience both the city centre and the old town during your walk to the institute. For me the city centre is done quickly. One idea is to have lunch half way either in the city centre or in the old town, to break up the walk in 2 steps. A taxi to Institute Oceanographique is about 10 mins and easily hailed by the railway station. Quick and convenient but you will miss out on some nice views. 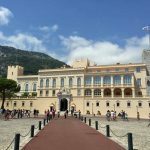 Le Palais De Princes in Monaco Old Town. You will enjoy this nice view of Monaco Harbour when walking to Institute Oceanographique. Depending on chosen route, the walk from the Oceanographic Museum to Plage Mala will be 4,2km – 4,9km and take somewhere between 1 hr – 1 hr 25 min. We took the shortest route and walked in normal walking pace but stopped to enjoy the views a couple of times and finished in 1 hr and 45 mins. Do not forget to bring drinks to stay hydrated during the walk, especially on a hot day. Walking out of Monaco is slightly surreal and you are rewarded when you reach the sea front and walk along it. There are lots of magnificent villas nestled along the boardwalk between Monaco and Cap D´Ail and there are information boards on the historical houses. 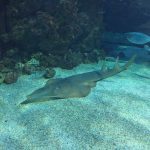 There is also information about the marine life along the coast but maybe not your highest priority after having spent a half day at Institute Oceanographique. You might not think about it while walking but it is actually pretty cool t0 cross a border between two countries on foot. 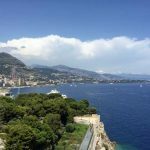 This is the beautiful coast line between Monaco and Cap D´Ail in France. This is the boardwalk along the coast between Monaco and France. The boardwalk is currently being repaired on the last stretch down to Plage Mala which means you will have to do a little detour into the village and go down to the beach via the stairs. Not a big deal for most people, but good to know if you are not 100% mobile. I expect the boardwalk to be repaired and reinstated by spring 2017, but not confirmed. Once you arrive at Plage Mala you will have the choice of 2 beach clubs, Eden Plage Mala and La Reserve De La Mala, or the public beach. Both clubs offer sunbeds, umbrellas, towels, restaurant, bar and a DJ. I believe they are equal in standard and offering but (unfortunately) I cannot pass a fair judgement because I opted for the public beach. The public parts of the beach are at the ends, with both beach clubs in the middle. You will have access to lavatories and fresh water showers on the public beach, not only at the private beach clubs, at Plage Mala. Plage Mala is a beautiful beach, almost paradise beach, and close to Nice. 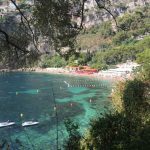 If you are lucky you might be able to spot any of the celebrities living in Cap D´Ail, since it is a very local beach. Once you have laid out your towel, you are ready to relax and enjoy the crystal clear waters. The beach itself is pebbles as most beaches in southern France. In other words, bring your bathing shoes. In high season you will not be alone on the beach at Plage Mala but it did not feel crowded and the sheer natural beauty will take your breath away. I hope you will have a great time at Plage Mala! The bay at Plage Mala is simply stunning and a great place to relax. Approaching Plage Mala by stairs from Cap D´Ail village. 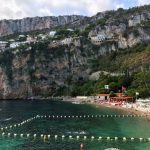 Plage Mala is nestled between high cliffs and extremely beautiful. Cap D´Ail is a nice village with winding roads. There are buses from Plage Mala but on low frequency which made us take a walk to Cap D´Ail Gare. The straightest way from Mala Beach to the railway station does not pass the centre of Cap D´Ail. This is the first station after Monaco, which means you will have about 20 min train ride to Nice. 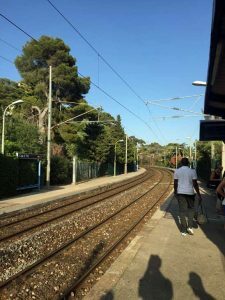 Gare De Cap D´Ail. Goodbye for this time. We will come back for sure! For me, this is a perfect mix of learning and relaxation and a day well spent. Hopefully it will appeal to most members of your travel posse. Click here if you want to read more articles about France. 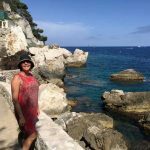 I would love to hear your own special tips on day-trips from Nice. Please get in touch via email, in the comments below, on Twitter, Facebook or Google+ with your tips!